Residing on the first floor of Hyatt Regency Beijing Wangjing, the Chinese Restaurant Cang Yue showcases an exquisite array of authentic Northern and Southern Cuisines, creating a unique dining destination in the capital city.From the north to the south, Cang Yue presents a unique culinary diary of seasonal specialties, taking visitors on a journey of taste and mind. The moment visitors enter the restaurant lobby, they are greeted by lights hanging from the ceiling that resemble bamboo joints. Echoing the bamboo forest from the hotel lobby, the lights create a feeling of Zen. Stepping into the dining area, the usage of leather furniture gives the restaurant an instant modern touch. Meanwhile, the wooden folding screen with traditional decorative patterns are scattered around, to create a warm and cozy ambiance. Even though the overall the restaurant is designed with modern elements, traditional Chinese influence is still interwoven, in a gentle statement of ‘yin’ and ‘yang’: seemingly opposing elements, peacefully merged. The public dining area and eight private dining rooms was meticulously designed, with great value for money, ideal for distinctive celebrations and exclusive social occasions. Cang Yue combines northern and southern cuisines in one place, mainly featuring Cantonese cuisine, Pekinese, and extending to Jiangnan cuisines. They not only present the diners with the authentic local cuisines, but also reflect the broad and profound Chinese dining cultures. Cang Yue carefully selects fresh ingredients. The restaurant’s concept of providing ‘the best seasonal and regional’ ingredients is combined with modern healthy cooking methods, takes one on a journey of refreshing taste and mind. 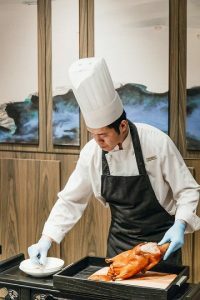 Cang Yue not only integrates the classics of north and southern cuisine, the team of chefs devote themselves to exploring unique ingredients. They respect yet are not confined to traditional culinary skills. With a taste of both old and new, there’s both a sense of familiarity and surprise. Keeping to the letter of a thousand-year old healthy nutritional secret Cantonese recipe,the Steamed Mastutake and Tofu Soup, not only has health benefits, the seasonal mushroom giving it an intense aroma, distinctive texture and natural flavor. Braised Bighead Carp is one of the most representative Beijing dishes of Cang Yue. Made from fresh bighead carp, the stewed fish head with sauce is the centerpiece of Miyun’s authentic fish head banquet, there is no doubt a bite will have visitors craving for more. The Jiangsu–Zhejiang area has a traditional famous food – Poached spring chicken “Jiangnan” style. It is as if the Huangjiu, the intense overflowing aroma of Shaoxing wine, immediately transports one to the tranquility of the southern water towns. The team of professional culinary curators are the reasons behind Cang Yue’s extensive food selections. As the ancient Chinese saying goes: “specialist only master his own field.” The three different cuisines are “crafted” by three different chefs team, led by three head chefs who were trained by famous master chefs. To them, the art of culinary is the strong ties to their hometowns, and the dishes they present are the emotional connections to their loved ones on that side of water and soil. It is the taste of home. Although the three teams of chefs have their skills in their specialties, the true test of merit lies in creating a careful balance the culinary wisdom of each individual chef with a careful selection of dishes and ingredients of each region. 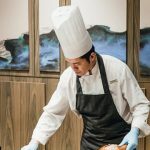 In order to continue to provide guests a unique dining experience, the teams of chefs visit various parts of China every season during a year to collect local flavors and specialty ingredients to adapt to seasonal changes, so that the guests may experience the various flavors of the four seasons. Cang Yue’s food selection can be seen as the chefs’ personal culinary diaries, included with experiences, thoughts and feelings, so that even in the Imperial City can one experience an authentic taste of their hometown dishes. For more information about Hyatt Regency Beijing Wangjing, please visit: hyattregencybeijingwangjing.com, or contact the hotel at 86 (10) 8630 1234.